Discussion in 'AKB48 News & Releases' started by natsu-kun, Mar 20, 2015. Membership of AKB48 Fan Club "Nihon-bashira no Kai"
The election guidebook will be out on May 13th. Did wonder why they didn't take Nagoya or Osaka Kyocera Dome instead- but I think it's all good since it's indoors. Less grand though. I still think it's weird for them to go all the way to Fukuoka, though. Like... what's wrong with SSA? Or Yokohama Arena? 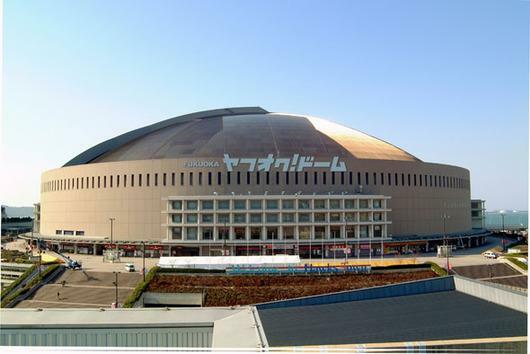 Or the good old Budokan? Venue: Fukuoka Yahoo! Auctions Dome. Most likely the roof will be closed becaus they don't want to deal with the weather and noise issues like last year. AKB48 41st Single Sousenkyo Site:sousenkyo.akb48.co.jp. Comes out in August as usual. A dome is a dome, it has a certain amount of prestige plus it's indoors so weather isn't an issue plus it'll be easier for the tv production. Hopefully they'll be able to do the SSK from other cities in the future too. I understand them wanting to go big for such an event, but dunno. The Budokan series concert didn't seem like step backwards after performing at SSA. I suppose they'll do the usual concert + election thing. Well for the last 2 years they went for a stadium for SSK, descaling it back to arena or budokan would be too much of leaping backwards. Keep in mind this is in the middle of the baseball season. It is possible the other Domes may be in use that weekend. And as someone who had to sit and get drenched in that friggin' rain all day last summer, this is such a relief. In any case, I think it's cool that they are doing this event outside of Tokyo for once. I mean HKT/NMB/SKE are just as much a part of the organization as AKB. Why not have the Sousenkyo in Fukuoka? The other question is how will they handle the broadcast. Movie theaters or television? I gotta wonder if they might go the theater route this time around. The theater editions must be preordered via chara-ani, and they cost around 1050 yen. If you are in town during the release/voting then you can simply buy the regular edition, which are around 1600 yen. youtube or niconico stream would be ideal for me lol. But BS Sky perfect probably got that exclusively with the senbatsu on FujiTV as usual(?). What a clean&clear thread, with all the source and information we need!! I immediately linked having the venue in Fukuoka with the mega push of Sakura and Sasshi being the challenger, but know that they just said it was for weather and noise issue, it kind of killed the hype lol. That being said, it is clearly an advantage for HKT fans to play in our field, as i don't think people from Tokyo region will massively come to Fukuoka just for the sousenkyo. It means it will be mainly locals, and more chance to have a lot of HKT fans in the audience. To have Sasshi victory, Sakura in Kami7 and Haruppi in senbatsu in Fukuoka, can't we dream more than that? Interesting to see it in a dome this year (guess they didnt wanna deal with the weather this year). Wonder if we get a concert before it like we have the last two years? @gocchisama you're right, not that many people will. I really wanted to go, but the whole fukuoka thing is killing meeee. I've got no problem with it being in Fukuoka, but I'm quiet surprised because it's their 10th anniversary, so I would have just assumed it would be in Tokyo. As others said, I would much rather an indoor dome where no one gets wet and freezes from the wind and rain. I was thinking about that. Having the event in Fukuoka would definitely cause a spike in television viewership.